Actual for real-real calendars can be cool, but sometimes they just feel like way too much work. You gotta remember to mark the days or rip out pages every single day. Those “word a day” calendars might as well be called “30 words crammed into one day at the end of the month” calendars. I thought the Bubble Wrap Calendar would work for me because that’s actually fun to use, but all the bubbles for the year got popped by January 2nd. But the Ink Calendar by Oscar Diaz is perfect. 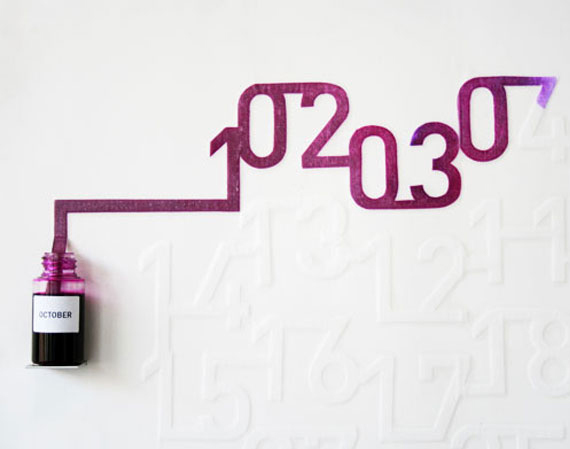 The ink spreads and gets absorbed slowly throughout the month so the numbers appear as each day passes… which means you don’t have to remember to do anything. Each month uses a different color ink based on the temperature, such as blues in the winters, greens in the spring, etc. 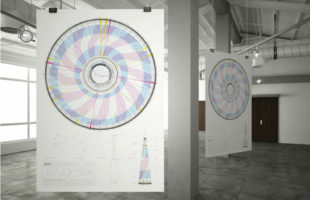 Unfortunately the Ink Calendar isn’t for sale—it was created for the “Gradual” exhibition at the London Design Festival.